Tough and agile, the FUSO FE130 punches well above its weight. Powered by an innovative two-stage turbocharged diesel engine with a dual-clutch automatic transmission, the FE130 boasts low emissions, exceptional fuel efficiency, and higher payload capacity. Along with increased productivity, you’ll have the protection of our 5-year/175,000-mile powertrain limited warranty, and the durability and longevity that comes standard with FUSO. The FE130 is an ideal truck for appliance and package delivery, and transporting air cargo. A true workhorse. Powered by an innovative two-stage turbocharged diesel engine with a dual-clutch automatic transmission, the FE130 boasts low emissions, exceptional fuel efficiency, and higher payload capacity. Along with increased productivity, you’ll have the protection of our 5-year/175,000-mile powertrain limited warranty, and the durability and longevity that comes standard with FUSO. The FE160 is an ideal truck for construction, landscaping, and transport industries. Raising the bar for comfort and agility. Powered by an innovative two-stage turbocharged diesel engine with a dual-clutch automatic transmission, the FE130 boasts low emissions, exceptional fuel efficiency, and higher payload capacity. Along with increased productivity, you’ll have the protection of our 5-year/175,000-mile powertrain limited warranty, and the durability and longevity that comes standard with FUSO. The FE160 delivers superior performance in any industry, including landscaping, grounds keeping, and construction. The FE160 sits up to 7 comfortably. The agile heavyweight. Powered by an innovative two-stage turbocharged diesel engine with a dual-clutch automatic transmission, the FE130 boasts low emissions, exceptional fuel efficiency, and higher payload capacity. Along with increased productivity, you’ll have the protection of our 5-year/175,000-mile powertrain limited warranty, and the durability and longevity that comes standard with FUSO. When the road ahead is rough, you can count on the FUSO FG4x4 to get you through. The only four-wheel drive cabover in the industry, the FG4x4 delivers extra traction and climbing capability at the push of a button. Rugged terrain, wet conditions or snow-covered streets can’t keep this truck down. With its heavy-duty axles, all-terrain tires, locking hubs and 9 in of ground clearance, the FG4x4 is built to handle adverse conditions. Our all-wheel-drive system lets you switch easily between rear-wheel-drive and all-wheel-drive. Powered by an innovative two-stage turbocharged diesel engine with a dual-clutch automatic transmission, the FE130 boasts low emissions, exceptional fuel efficiency, and higher payload capacity. Along with increased productivity, you’ll have the protection of our 5-year/175,000-mile powertrain limited warranty, and the durability and longevity that comes standard with FUSO. Pushing the research and development envelope has always been the FUSO way. Powered by a state-of-the-art HV battery pack and a permanent synchronous e-motor, the eCanter puts out an impressive 185 kW with powerful torque. Along with taking a cutting-edge approach to power, the interior was designed with an eye for modern details. 12″ digital displays, ergonomic seating, keyless start and button shift provide a hassle-free interface between vehicle and driver. And since we’re talking cutting-edge, the eCanter is completely silent and emission-free. Available in both a flatbed and van body options, this light-duty truck is an easy choice for urban delivery and green applications. At FUSO, we aim to provide our customers with the right tool for the job. Say hello to the new gas-powered FE Series truck. With the gas-powered FE Series you can count on exceptional FUSO visibility and car-like maneuverability, while also taking advantage of higher torque and power. 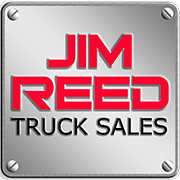 Available in three models, the FE140, FE160, and the FE180, the new gas-powered truck brings the perfect blend of versatility, capability and efficiency to tackle any job. This brand-new FUSO model is powered by a gasoline engine with twice the diplacement of a diesel, generating more horsepower and more torque. The Allison 1000 Series 6-speed automatic transmission ensures smooth shifting and excellent fuel efficiency. And as a FUSO-exclusive option in its segment, the Allison has easily accessible provisions for the application of a broad range of after-market power take-offs (PTOs). The FUSO gas truck can handle heavier jobs than the competition, thanks to its superior load-bearing capacity. The FUSO ladder-style frame is lighter than its competitors, while still possessing a sturdy 56,565-psi yield strength. Larger than its competitors, this fuel tank will keep you on the road longer and farther between fill-ups. 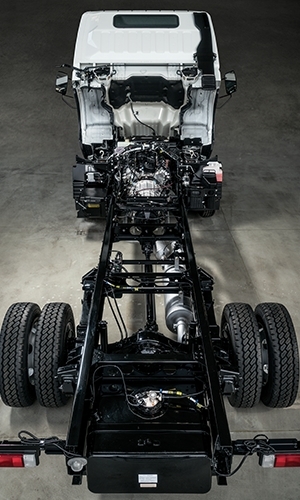 As part of Daimler, FUSO utilizes the expertise of North America’s premiere chassis manufacturer – Freightliner Custom Chassis Corporation. All FUSO FE Series gas trucks are designed, engineered and assembled with the most rigorous ISO-certified standards.